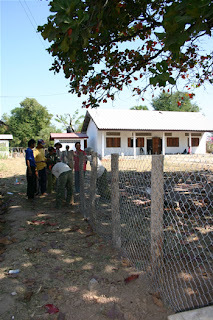 Building a fence, we have learned, is the perfect way to learn about the intricacies of a culture and also of working in a developing country where resources are not always available. It’s also an education into just how much work goes into building something as basic as a fence. Finally, it taught us to trust that as long as we keep persevering and working with the stakeholders and the community, everything will work out in the end. Day 1: We got off to great start. The contractor showed up early and started work on building the four concrete posts that would make up the corners of the fence. This is actually quite an undertaking, requiring two men to bend and cut (using the most basic of tools) the rebar wires that provide tension strength for the posts. But then there was no sand available left on the island to make the concrete, it had to be brought over from the mainland, so work stopped for the day. Day 2: Still no sand. Also, we need 75 solid wood fence posts, considered quite a lot on this island—hence they are being gathered from around the island and beyond. But good news! We have been told that we should have 40 people coming from the community to help build the fence. Also, the parent-teacher association will cook lunch for everyone. This is excellent news because it’s important to create a feeling of ownership of the school within the community so they will continue to support it on their own. Day 3: The sand arrived! We ended up with quite an interesting work crew--the contractor and his son along with the principal’s family (including three young children), and some of the neighbourhood kids. Thanou also pitched in, mixing sand and concrete. It was mixed on a flat section of the ground, looking very much like they were making dough for a giant loaf of bread. Even the youngest children (around 4 or 5) took turns mixing the ingredients. Fortunately, there were some bricks left over from the building of the outhouse, so they started by building a small staircase for the school (the school was built with money donated from another organization, but it ran out, so it was never finished). Now the kindergarten children won’t have to wriggle onto the concrete platform on their stomachs just to get to class—they can walk up the stairs! Next, all of the posts were successfully poured into the wood “forms” (wood boxes that shape the concrete). In order to create strong cement you need to have a “continuous pour,” so we had line up a bunch of buckets (transported via a wood wheelbarrow) and quickly dump them in one after the other. Also important is to keep the cement moist—the slower it dries, the stronger the cement, so the contractor will keep wetting it down for the next day or so. The wood posts still have not arrived. Day 4: Free day! Attended an island fair rumoured to have been paid for a foreign Laotian, complete with song and dance performances and one children’s ride (a merry go round, powered by a man standing in the middle pushing it). The whole island showed up, many having walked 10 kilometres or more with seniors and children. They weren’t disappointed; everyone had fun, socializing, watching the show and eating local treats (fruit, rice crackers, boiled peanuts and corn, and various meat-on-sticks). I was the only foreigner in a crowd of about 4,000 people, so I got plenty of attention, especially when I started dancing to the music. Day 5: This was supposed to be the fence building day, but it didn’t happen. The posts had not arrived, which was just as well since the mayor had asked that we push it a day forward -- many people could make it on that day. Day 6: Fence building day! We arrived at 8 am to find women cooking, but no one else. The men started arriving at 9, and an hour later we had 21 people. The funny thing was that they had been told to bring either a hammer or a shovel, so you can guess how many people brought shovels—none! So we had to scramble to find shovels to dig the 75 post holes—which had to be 30 cm deep. Also, the men demanded that we buy them a bottle of Lao Lao (local whiskey) to pass around (an investment of only $1). This, we were told, was a community work event and they always drank ceremoniously together during such events. Though I must admit I had some reservations, we felt it was best to comply—it’s not a good idea to mess with cultural norms, especially when people are working for free. The next challenge was that the men were not thrilled with me videoing and photographing them while they worked, saying they felt like they were back to working under the French (who occupied Laos up until the 1950s). Fortunately the organizer jumped in to explain that we were quite different in that we were there to help their children have a better future, and not for our gain, and that we had to document it for our donors. 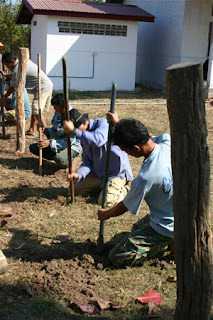 It helped that Thanou (who is Laotian, but is considered foreign since he grew up in Canada) worked hard alongside the men, digging and hauling posts, and I even tried to do a post or too, though must admit I was fairly feeble. The wood is mostly hardwood and it weighs a ton. But each of these experiences is invaluable as they teach us the importance of clear and constant communication, not to mention flexibility. History has not been kind to the people of Laos, and like all people, their beliefs, perceptions and ideas have been shaped by this history. We need to respect this and, of course, respect these people who have been through so much. We have much to learn from them. One thing we learned was something the Lao people have known for a long time—that it’s always best to work together to accomplish anything. The first two sections (approximately 36 metres each) were completed by 11:30 and we found we had leftover materials to do a third side (which we originally thought would be too expensive). All three sides were completed by 1 pm. Then the women rolled out a mat and spread out various Lao specialty dishes (beef stew, laap and papaya salad) for the men to share. It was my job to walk down the line and offer each man a shot of Lao Lao, as part of the completion ceremony. Then we sat with them and ate—the women had kindly prepared vegetarian dishes for us (eggs and water spinach). Conclusion: So as you can see, you can learn a lot from just building a fence. We are humbled every day by the things we learn here, and we are working hard to integrate all this knowledge in such a way that the children and community can reap the benefits.